Said goodbye to all our our new T@B pals this morning, and headed off to Bakersfield, neither of us knowing exactly what to expect. 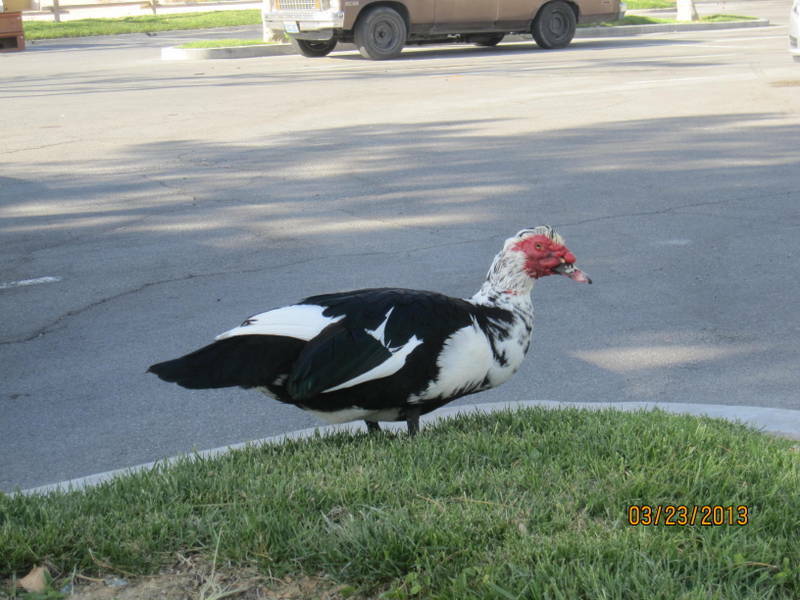 Just before leaving though, we found what perhaps is the world’s ugliest duck. Seems like the minute we crossed from Nevada to California the landscape changed. 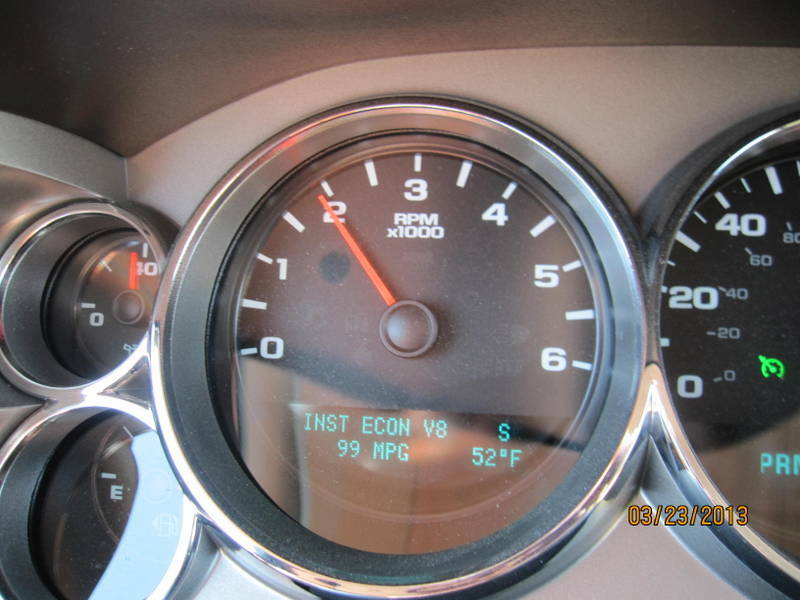 One of the best things is that we noticed we were getting INCREDIBLE mileage on our 2012 Chevy Silverado. Check this out…Take that, Toyota! Thanks, Chevrolet!!! Downhill with a tailwind. Cyclists know what we’re talking’ about. The euphoria quickly evaporated as we headed uphill, but we captured the moment, and we’re happy. Our route to Bakersfield took us to the very edges of Death Valley. No question as to what we saw out the window – it’s the most eerie landscape. When we hit the section near Dumont Dunes, it was just bizarre. Like someone had blown off the outer shell of a brownish mountain, and left a dazzling white inner core. There were ATVs running all over, and the air quality was dreadful. The distant mountains were hardly visible through the dust & smog. Don’t know if this is the usual view, or if we happened through on an unusual day, but it was quite unpleasant. Unfortunately, I have neither the photographic skills nor the equipment to have captured images to show. Bummer. We did pass a few fun sights though…. Would you ever get tired of spelling this street? As we got closer to Bakersfield, the mountains suddenly became green and beautiful. On the descent, we came into the citrus valley – past miles of orchards. We’re camping for the night in a place called Orange Grove RV Park. With our camp fee, we not only get WiFi, and cable TV, wonderful clean bathrooms and showers, laundry, AND a free bag of oranges. 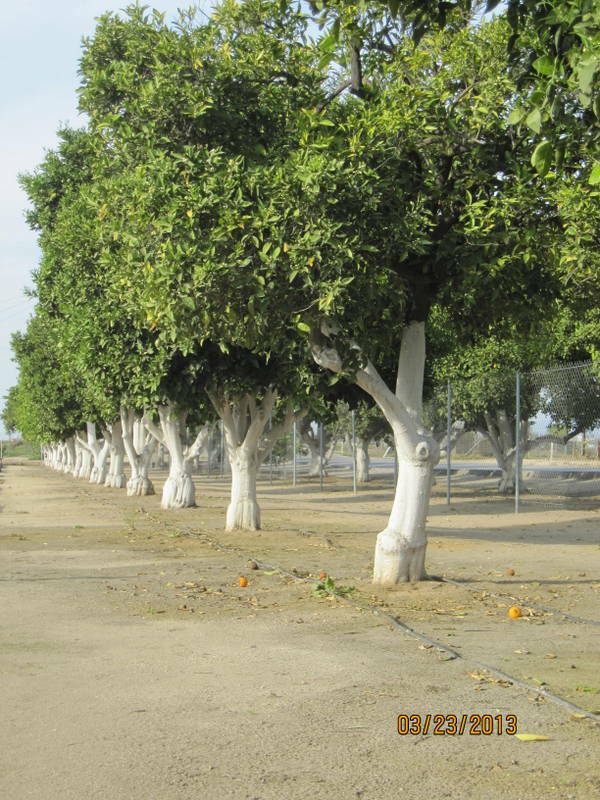 We’ve got two orange trees on our lot. 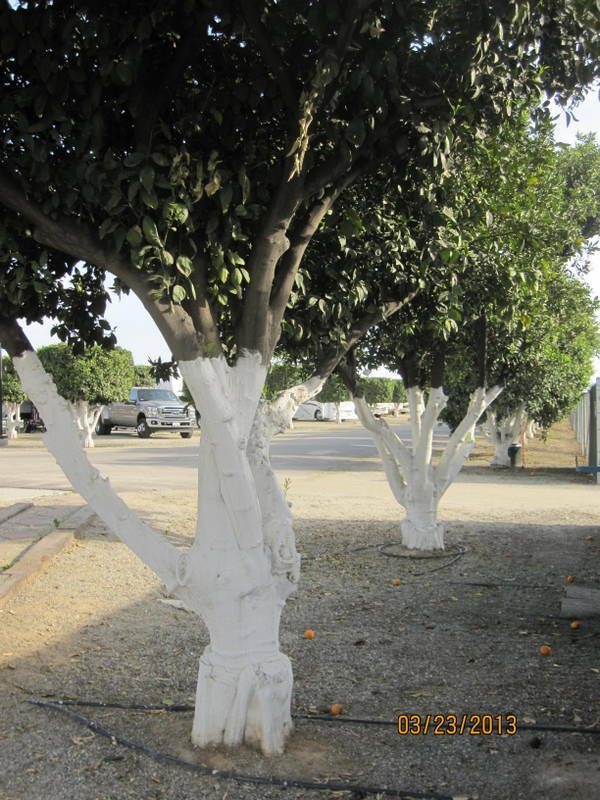 Curious thing though…they paint the tree trunks white up to the point where the branches start. Not sure if that’s an aesthetic thing, or some kind of insect control. Whatever, it does give the park kind of an antiseptic feel. View from the porthole. Although we’re pretty close to all of our neighbors, we can still squeeze in a decent view. We’re outta here tomorrow. Have to enjoy our last showers and amenities for a few days, as Yosemite will be dry camping at a fairly high altitude with no water/electric. We’re ready for an adventure. Don’t think we’ve fallen off the edge of the earth if there no posts for the next few days. We’re doubtful that cell service is among the pleasure of Yosemite. 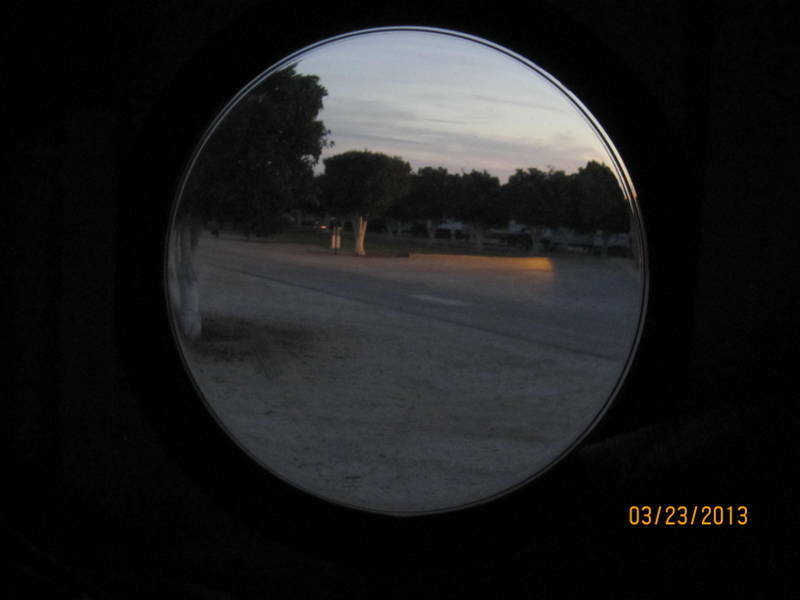 This entry was posted in California, great outdoors, RV life, simple camping and tagged California, camping, national parks, road trip, RV life, simple camping by Judy Crankshaw. Bookmark the permalink. 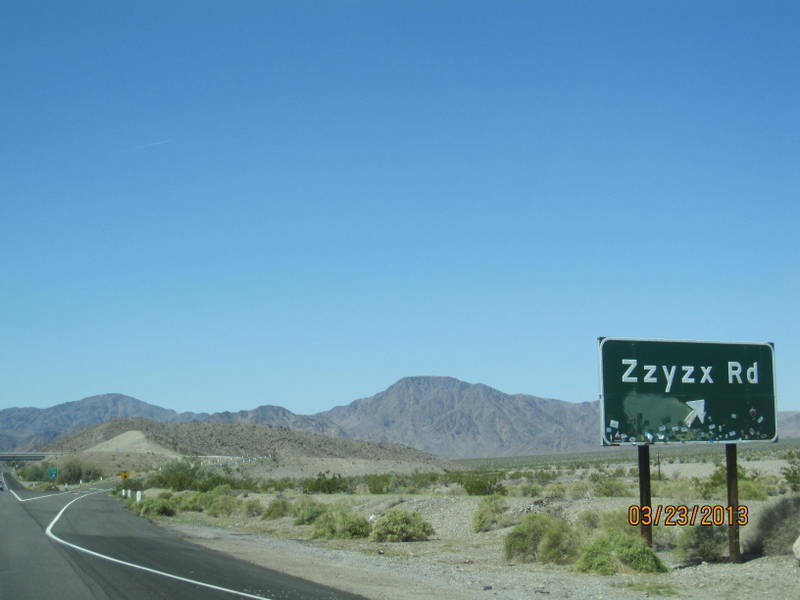 My most vivid memories of Death Valley were the crazy signs in the middle of nowhere: “Cattle Crossing” and “Watch for Low-Flying Aircraft”; and of the total lack of anything (trees, buildings, wind, etc,) to orient my speed while driving. I found myself driving 100 mph without having any sense that we were even moving. That was back in 1963 before cruise control. The air quality was fine, but the heat was unreal in August. Have fun at Yosemite. The beauty is overwhelming. Be sure to ride your bikes in the Valley. 100 mph? Alison, you are my hero! But, at that speed, you could never get 99 mpg. We’re hoping for lots of good rides in the next three weeks, but will happily settle for hikes if rides aren’t feasible.